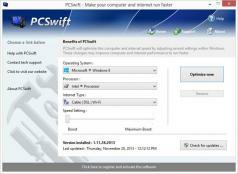 PCSwift is an easy to use and incredibly reliable application that gives you the opportunity to make your computer run as fast as it did the day you brought it home. Every time you download something to your system, it makes it a little slower. In fact, you probably have all sorts of things saved to your computer that you didn’t even know were there/no longer need – PCSwift is the program you need to help get rid of all of the garbage. Using PCSwift gives you the opportunity to work on a quick and efficient system, regardless of how old it is. - Lets you choose just how much optimization you want or need with the use of a handy slider. - Optimizes your entire system with a simple click of your mouse. - Has the ability to modify your internet settings as well, ensuring that your connection is always as fast as it can be. - Gives you the opportunity to restore your computer to its previous settings in the event that you’re unhappy with the changes that the application makes. - Makes small registry changes to improve the transfer of network packets so that you’re able to surf the web flawlessly without any interruptions.